Tasha, a senior at Arizona State University, is pursuing her bachelor’s degree in the School of Social Work. She says her personal experience has been a motivation in pursuing this line of work. Tasha shares that she has struggled in the past with substance abuse and has been sober for five years. “I know that recovery is possible and I want to inspire and help others realize that,” she says. Taking the steps to reach this goal, Tasha enrolled in the social work program at ASU, along with Kim Speed, who is interning alongside Tasha at Ozanam Manor. Kim says she would love to work with veterans in Arizona, doing trauma counseling for PTSD and substance abuse. Like Tasha, she can relate to these struggles, as she is veteran and immediately sought support after she completed her time in the Army and returned from her tour in Iraq. As senior year approached, both Tasha and Kim began looking for a field internship (required for the degree) to apply what they had learned in the classroom to real-life caseloads. That’s when Ozanam Manor became a new part of their weekly schedule. Ozanam Manor, SVdP’s temporary shelter, provides a bridge to permanent housing for homeless men and women over 50 who are physically or mentally disabled, and disabled adults age 18 and above. During their stay, residents receive help with job placement and rehousing assistance. “Interns at Oz help in all aspects of day-to-day operations, from pre-screens, intakes, caseload, filing, reports and more,” says Maribeth Schmidt, Ozanam Manor clinical supervisor. SVdP has been a long-time partner with ASU for field internship opportunities. Maribeth interned at Ozanam Manor herself in 1998 and has been working in the shelter since. According to Maribeth, interns have the same experience as an employed case manager, but instead of having 20 clients, they are typically assigned seven to ten clients. Clients are required to meet with their case manager once a week. Tasha and Kim come out to Ozanam Manor twice a week and work a typical day from 8 am to 5 pm. Although they just started the internship in late August, both have already been assigned three clients each, done pre-screen interview with potential residents and helped with new resident intakes. In their short time, they have even suggested the creation of a new group activity for the residents – a ‘venting group.’ Tasha and Kim would like to hold and moderate a weekly group session where residents can talk about their frustrations or just share about their day. Agreeing, Kim says she was also surprised to find out how good she felt after a long day. 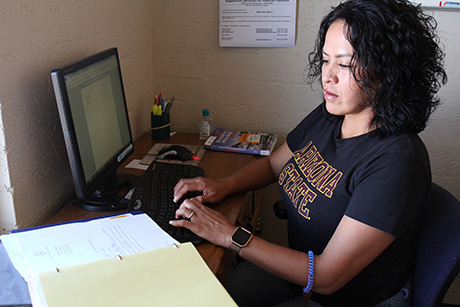 Nick Caruso, ASU School of Social Work professor and field internship liaison, says students in both graduate and undergraduate School of Social Work Programs identify field placements as the single most important component of their social work education. That couldn’t ring more true for both Kim and Tasha, as they continue to eagerly dive into working one-on-one with residents at Ozanam Manor. We look forward to seeing the great work they will undoubtedly accomplish this year and continue to be grateful for our long-standing partnership with ASU programs, staff and students.